Here you will be sank into the cool world of racing. Just drive your motorbike and show everyone that you are the best here! Use the arrow keys and space to jump. Beat off all the opponents and come to the finish first. You will be the best here! This is the best game you have ever played! 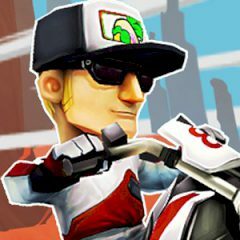 This is a free-to-play real time multiplayer motorcycle racing game, where you can use all your skills and just show everyone that you are the best racer in the whole world. In this game you will collect coins to upgrade your racer. Do not forget to unlock all items and achievements and be in the leader board! Be sure that you can cope with it, just have faith in yourself! So, just be ready for many obstacles and you will be in the center of all events. Have so much fun!